Whenever I go to the grocery store I usually just buy chicken breasts or whichever part of the bird I want to cook that night, but there is something to be said for taking the time to cook a whole bird every now and then. This week whole organic chickens were on sale at my work for only six bucks, so I had to get one. The reason I usually don’t cook a whole chicken, and probably why you may not either, is dealing with cutting it off the bones afterwards. This is where spatchcocking comes in handy. Spatchcocking a chicken is basically cutting out the spine, breast bone and ribs, so that you are left with only the meat and the bones for the limbs. 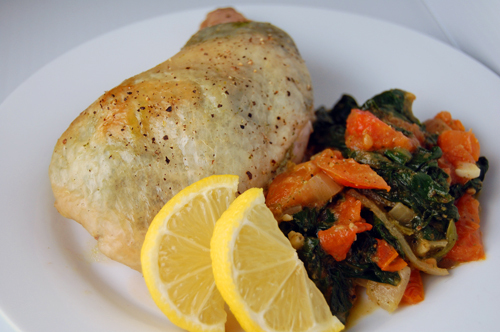 It makes it extremely easy to cut and serve the meat once the chicken is cooked. For my spatchcocked chicken, I added pesto and onions to make a tasty dish. One benefit of keeping the skin on the bird it that you can stuff any sort of spices or seasonings in between the skin and meat to cook it with extra flavor. 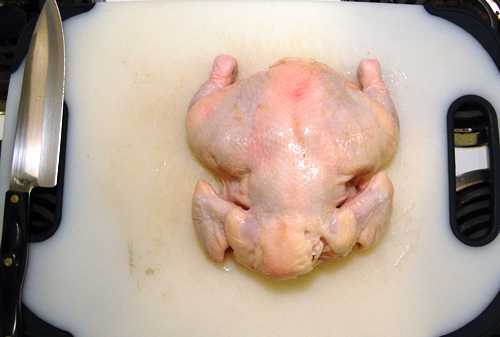 Place the chicken on a cutting board, neck facing you. Using kitchen shears or a large knife, cut down each side of the spine and remove it, along with the ribs, from the chicken. 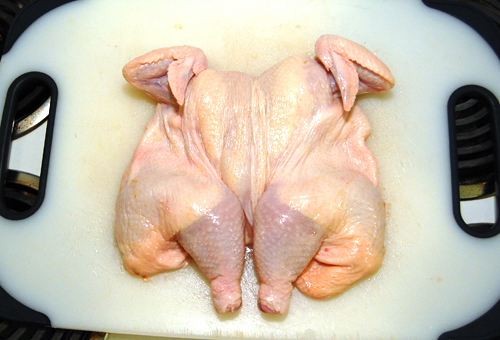 Fold each side of the chicken outwards, exposing the breast bone. NOTE: It will be the diamond shaped bone that you see. 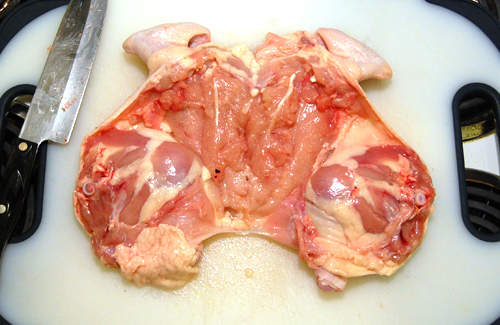 Using the shears or knife, cut out the breast bone and any excess cartilage. Flip the bird over and fold the legs and wings outwards. 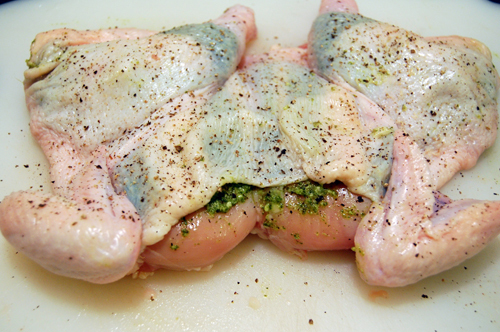 Using you hand or a spoon, lift the skin over each breast and thigh and spread pesto evenly underneath the skin. Stuff a few slices under the skin of each piece as well and season with salt and pepper. Transfer to a baking sheet and bake at 375F until entire bird is cooked through (about 35-40 minutes). 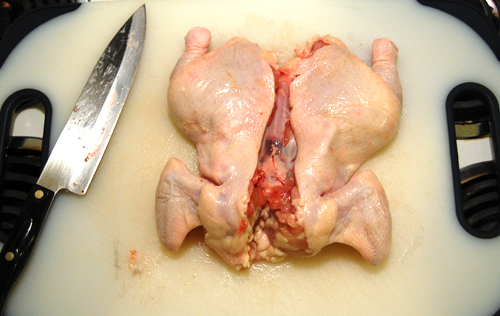 Cut the breasts, wings, thighs and legs into separate pieces and serve. My roasted chickens are always dull, no matter what I do to them. PESTO is something I haven’t tried yet!! Maybe there’s still hope for me!! I also use this method for my roast chicken. Rubbing butter and placing fresh herbs under the skin is another easy version which lends to more tasty chicken. I just had a great pesto the other night and have been trying to get my hands on more over since. I love your tutorial for spatchcocking (wont lie, I also love typing spatchcocking. lol). 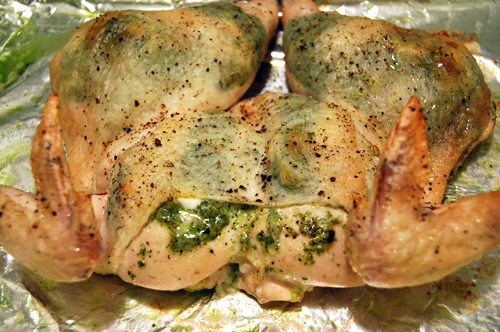 Great looking chicken, especially wit the pesto. roast chicken always tastes great, and you added another layer of flavor. Yum! I didn’t know that was called spatchcocking! Thanks for the education!